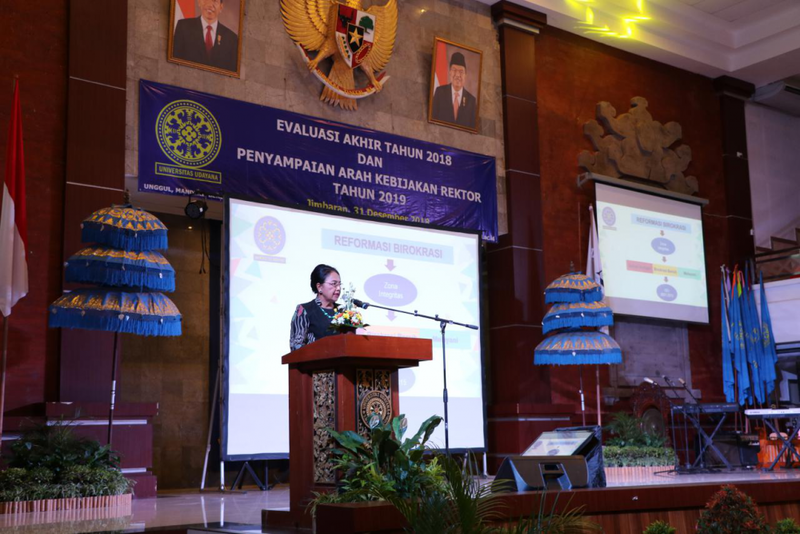 Jimbaran - At the end of 2018, Udayana University held an "Final 2018 Evaluation and Submission of the Rector Policy Direction in 2019". The event began with the Presentation of Unud's Rector, Prof. A.A Raka Sudewi. The event which was held at the Bukit JImbaran Campus Widya Sabha Auditorium (31/12) was also attended by the Chair of the Senate, Dean, Post Director, lecturers, staff and students in the Udayana University environment. In his presentation the Rector conveyed various efforts that have been carried out during 2018 both in increasing capacity and quality in the fields of governance, resources and facilities, Tridharma of Higher Education, Student Affairs, Cooperation and Internationalization as well as 2019 TA work plans and achievements obtained during 2018. It was stated that in the field of governance, bureaucratic reform has been carried out through corruption-free integrity zones, clean bureaucracy and serving and implementing ISO 9001: 2015 with risk-based quality management. For performance accountability in accordance with the results of evaluation of the performance accountability of government agencies carried out by the Ministry of Research, Technology and Higher Education, Udayana University won the B. 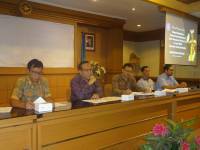 While in the field of human resources around 91.13% of lecturers at Udayana University were academically certified. Other achievements are also various efforts made in the improvement and development of information systems in IMISSU. During the period of 2018 various infrastructure developments have also been carried out, including building renovations and further stages of the completion of integrated laboratories. Other achievements obtained during 2018 were the receipt of several achievements including the 2018 National Procurement Award won by LPSE Unud, the Working Unit of the Best Performing BLU in the First Quarter of Denpasar KPPN and a Fairly Informative Award in Public Information Openness in 2018. In the event, there was also a handover of CSR assistance in the form of operational vehicles for the smooth running of tasks at Udayana University, and symbolic submission of Unud Student Cards by the Head of BNI Denpasar Regional Office to the Rector of Udayana University, coupled with the Grand Opening of BNI Udayana University Cash Office.